Waiting for TODAY. When my Tessel microcontroller and GPRS Sim900 add-on module arrived after a two week trip from the US, to my house near Wimbledon, in London, via somewhere in Germany. As I’m about to go on holiday, I don’t have a lot of time to dig in and really explore the uses but there was one thing I knew I could do pretty quickly – get it set up and send an email from it. 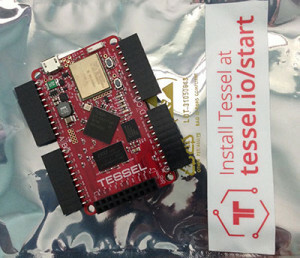 // There's a button on the Tessel, when it is pressed, send an email! In the above example I’ve used Needle for the HTTP request, so it needs to be added by creating a package.json file and declaring it in the dependencies. You could of course use the standard library HTTP request contained within NodeJS itself, but I think it looks ugly and over the top for an example like this, so I’ve used something cleaner and more readable. Why not use sendgrid-nodejs? I tried but one of the other libs that it depends on isn’t compatible with Tessel, so it fails when trying to load. Why not use Request? See above. Tessel WiFi can be problematic. A lot of time was wasted on being too far away from my router for requests to successfully complete but not really knowing why. Relatively trivial and I’m sure this won’t be the case for too long. I look forward to digging into this board further now that the awesome Cylon.js is ready for it.